We did our part to keep the wheels of commerce turning Friday night. We stopped by the Apple Store at West County Center to buy Kristin a new computer. She is now the proud owner of a 20″ iMac G5 and a 40 GB iPod, replacements for her G4 Cube and a 5GB iPod. We even bought a new printer. Apple and Epson are offering a $100 rebate if you buy a printer with a Mac, which made the Stylus C86 free after rebate. I was going to eBay it, but after checking the specs and learning it is faster than our old HP DeskJet 932C, we decided to keep it. So we’re going to auction the DeskJet instead. 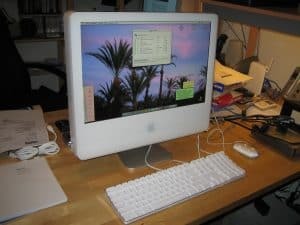 New iMac G5 to replace Kristin’s Cube. Kristin usually dreads getting a new system because of all the time required to move data to the new system, install software, etc. Migrating to the iMac was a breeze though. All we had to do was hookup a Firewire cable and connect to the Cube in target mode. The iMac pulled everything over and was basically ready to go right away. We had to reinstall the Microsoft mouse software and Norton AntiVirus, but that was it. Just found out we’ll be able to auction her external DVD burner as well because iLife ’05 will add DVD+RW/-RW burning capability to her SuperDrive. About time Apple! While setting up the iMac and swapping the two Macs, I used this opportunity to redo all the cables in the office for the Mac, PC, etc. Now everything is labeled, wrapped, hidden, etc. It was such a mess, but it looks good now.